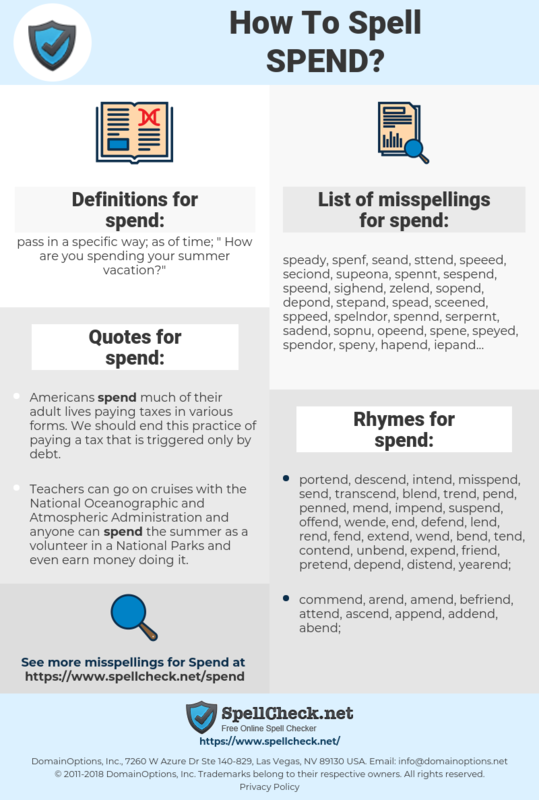 What are the misspellings for spend? What are the common mistypes for spend? What is the definition of spend? What are the quotes for spend? What are the rhymes for spend? What are the translations for spend? 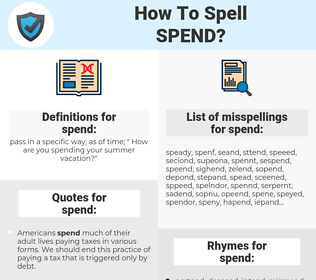 What are the common typos for spend? pass in a specific way; as of time; "How are you spending your summer vacation?" This graph shows how "spend" have occurred between 1800 and 2008 in a corpus of English books. We do spend time talking about it and we puzzle through it together. We ride the roller coasters together- the high highs and the low lows. 花上, 度过, 花钱, 消费, 动用, 消磨, 用尽(), 斥资. uitgeven, betalen, besteden, doorbrengen, spenderen, verteren, verbruiken. passer, investir, dépenser, débourser, payer. ausgeben, brauchen, verbrauchen, aufbrauchen, verbringen, loswerden, aufzehren, aufwenden, verleben.